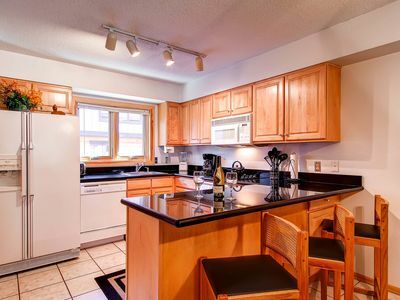 If you want a cozy, contently located unit, your search is over! 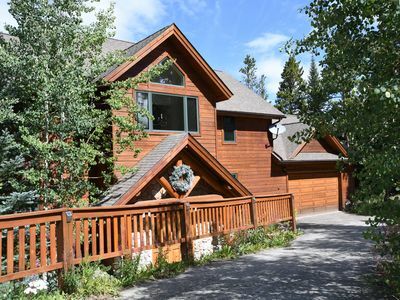 This a ski in / ski out unit with a nice view, 1/2 block walk to Main Street Breckenridge and excellent amenities (indoor/out door pool, four hot tubs, steam room, dry sauna, work out room, etc...). 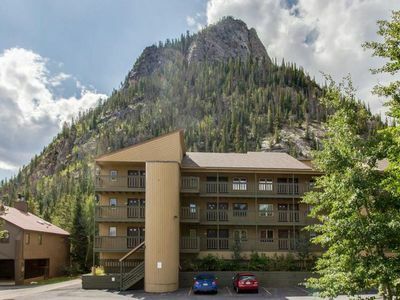 Discounts are available including; shuttle transportation from Denver International Airport, 30% off ski rentals in the same building as this unit, etc... You do not need a rental car when staying at this location. Let me know what you need and I can help. 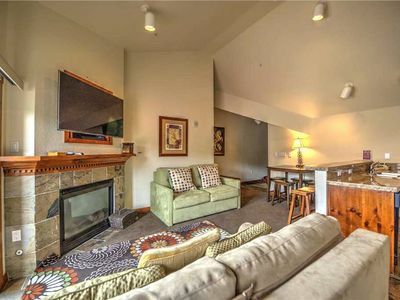 This ski-in/ski-out condo located in The Village at Breckenridge Resort which has excellent access to the Quick Silver High Speed Ski Lift. 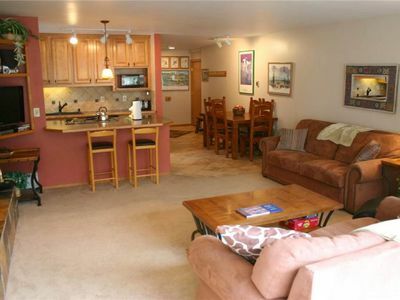 The Quick Silver is the closest ski lift to Main Street (the most convenient location). 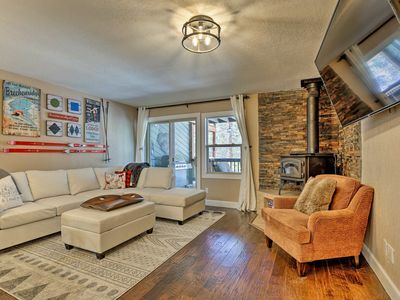 Breckenridge is famous for its Historic Main Street filled with art galleries, museums, shops, restaurants and night life. 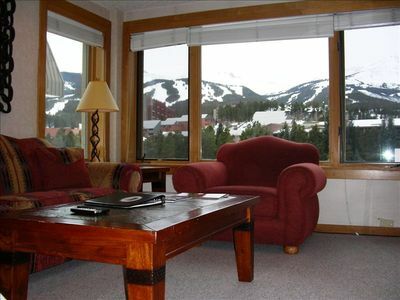 This studio unit appeals to a romantic couple or a family with one or two small children wanting to stay at one of the best locations in Breckenridge. The sleeping accommodations consist of a queen bed and a queen sofa sleeper. If you are looking for a larger unit with more queen beds… scroll down to the section identified as ‘Links to More information’ and click on ‘See All My Rental Listings’. 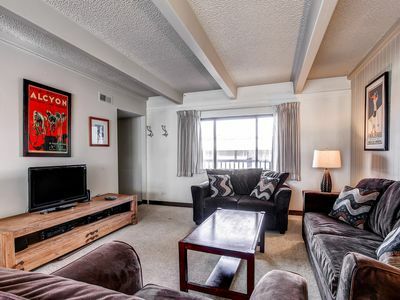 Units range in size from a studio (one queen bed with a queen sofa sleeper) to three queen beds/two full baths to even a largest unit with four queen beds/three full baths. Our goal is to place guests in 'the correct high-end condo at an affordable price'. 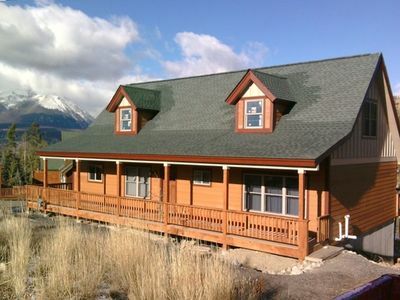 Please read the following guest reviews which rate this unit near a 5 of 5 stars. 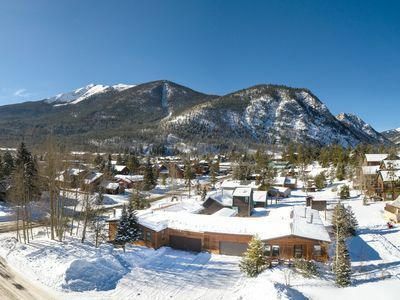 There are other Village at Breckenridge studios available to you. All the studio units are located in the Peak 9 Inn Building. What separates this unit from the pack? 1. Ski Mountain View 2. A corner unit condo, quieter than the others, as it is not located at the center of the building where the elevators are located. Additionally the unit faces both west and south (no just one direction). 3. 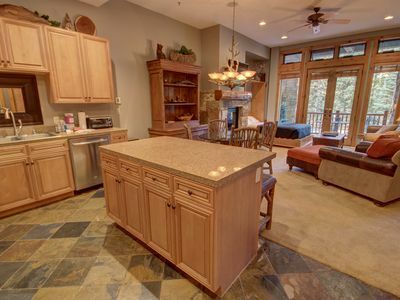 This unit is larger in square footage than the average size unit and is the largest available in the entire building. The unit has a private hallway when entering the unit. 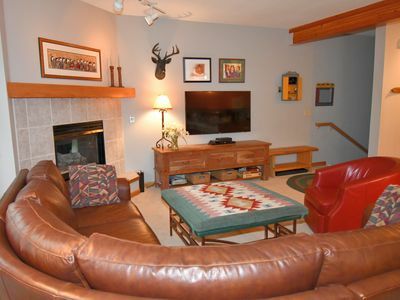 The living area has a 32' HDTV with Comcast/Xfinity On demand TV. The unit has a router/modem offering password protected high speed wireless internet to this unit. Additionally a DVD player is provided. 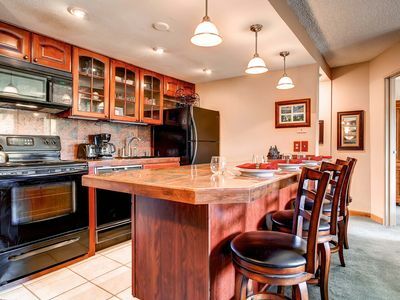 The kitchen is fully equipped with an oven, refrigerator, dishwasher, and microwave as well as the necessary cookware, utensils, and dishes. For your convenience a coffee maker and crock pot are included. There is also a large closet with an iron and ironing board, a humidifier and a fan. All linens, paper towel, etc… are furnished. A coin-operated washer and dryer are located on the same floor as this unit (laundry machines). 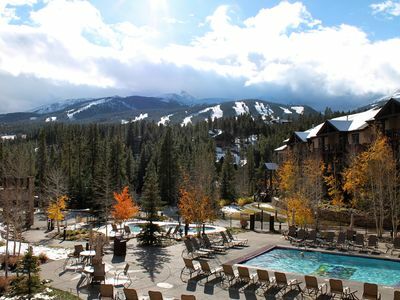 The Village at Breckenridge Health Club (located in the same building as this unit) has an indoor/outdoor swimming pool, four outdoor hot tubs, dry sauna, steam room (highly recommended in Colorado’s dry climate), workout room, and shower/locker rooms. The Health Club provides complementary towels for your use while you are using the area. Underground heated parking is available. 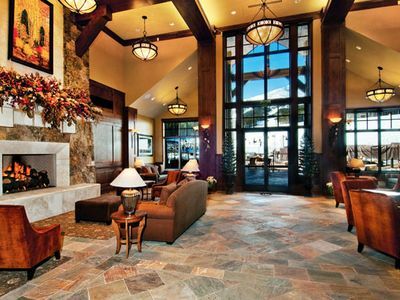 The Village at Breckenridge Homeowners Association charges for the use of these facilities. Avoid parking fees by utilizing the discounted shuttle to/from the Denver International Airport. Ice skating/paddle boats on Maggie Pond are also just steps away. 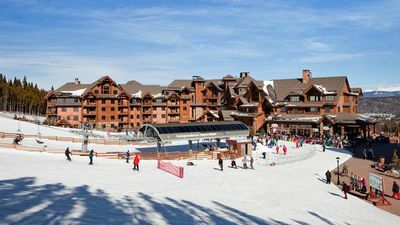 Across the street from the Village at Breckenridge is a stop for Breckenridge's FREE shuttle bus system that can take you throughout town or connect you with FREE bus services to other area resorts such as Arapahoe Basin, Keystone, or Copper Mountain. Non-Smoking, No Pets and No exceptions. 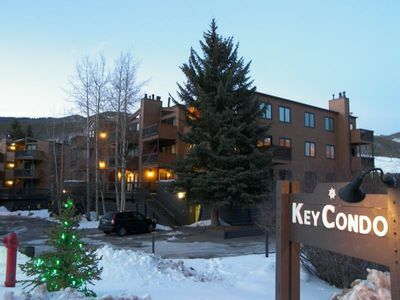 Keywords: Ski in ski out Village at Breckenridge Condominium. 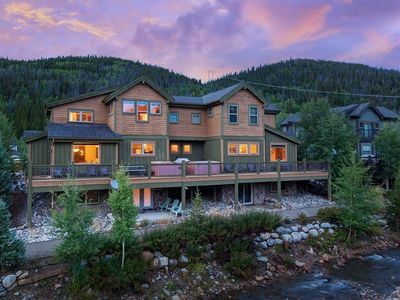 Great Central Location for a wonderful Summit County Vacation! 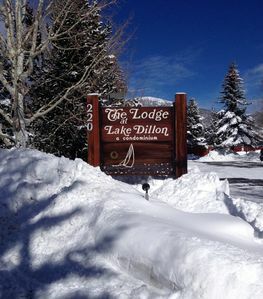 Snow Is Falling and So Is the Cost of Your Colorado Ski Vacation!! 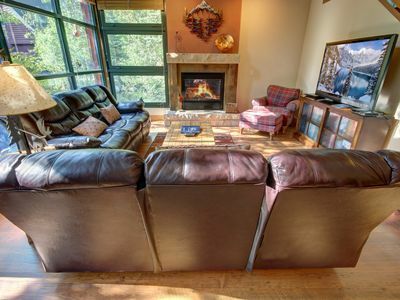 Gorgeous Frisco Mtn Lodge, 5 Blocks off Main St in Quiet Setting, 3600 sq ft. The Wellington Mansion - Accommodates up to 20! 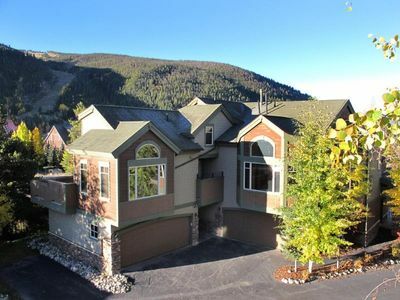 NEW-Breckenridge Townhome w/Fire Pit Near Main St!